Custom ASIC developed to monitor performance of up to 56 DS1s 1344 Channels ( T1 ) 1.544 Mbps . Provides counts of frame and CRC errors as well as an efficient far end data link message buffer. Input can be 56 DS1s with data and clock for each or 2 DS3s 44.736 Mbps 672 Channels each DS3. (DS3s are internally de-muxed. PM (Performance Monitoring) for the DS3s are available as well). 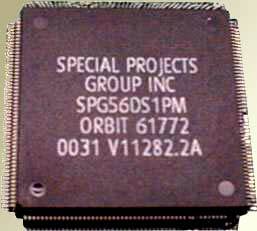 Packaged in a 208pin QFP. DS1 performance monitor (LOS, LOF, AIS, SF/ESF, LCV count, frame error count, ESF CRC error count).